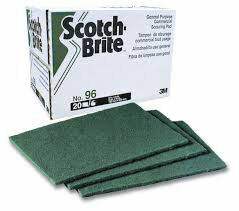 It is the original synthetic scouring pad and a performance pacesetter. Use it for everyday cleaning of most cooking utensils and equipment. It replaces steel wool and metal sponges and will not leave metal silvers in hands or food. Long Lasting, non-rusting and resilient.